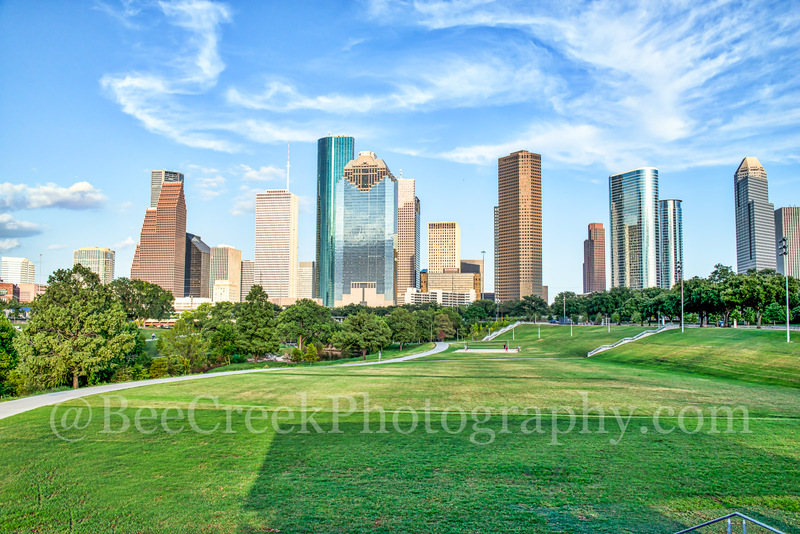 Houston Skyline from the Park – This is one of our favorite places to photograph with the many parks near downtown that also has a great view of the Houston skyline from the park. There are many hike and bike trails with fields for playing ball or start up a game of volley ball all with a wonderful cityscape with all the skyscraper high rise buildings in the city as a backdrop. The city view includes the usual skyscrapers like the Chase Tower, Heritage Plaza, Wells Fargo, and the 1400 Smith St. buildings just to name a few. You can see the Houston City Hall building at the base of the buildings where it is dwarfed by the high-rise skyscrapers since Houston has some to the tallest buildings in the southern US. The Buffalo Bayou run along side of the trials through out the park. This is the Eleanor Tinsley park that is right in downtown area along the Allen Parkway a wonderful addition to the city. It was name after Eleanor Tinsley who served on the city counsel for 16 years in 1998. What is so great is the Houston skyline from the park can be seen from most areas of the park and has been a huge addition to the city and a draw for locals and tourist that come to visit. Houston Skyline From Park – This is an image of the Houston skyline from a city park near downtown with all the skyscrapers towering over head. This is one of the many parks near downtown that also has a great view of the Houston skyline. The city view includes the usual skyscrapers like the Chase Tower, Heritage Plaza, Wells Fargo, and the 1400 Smith St. buildings just to name a few. You can see the Houston City Hall building at the base of the buildings where it is dwarfed by the high-rise skyscrapers since Houston has some of the tallest buildings in the southern US. There are many hike and bike trails with fields for playing ball or start up a game of volley ball all with a wonderful cityscape as your park backdrop, what could be better than that. The Buffalo Bayou also run along side of the trials throught out the park should you want to kayak a bit. Posted in Photo of the Day and tagged buildings, canvas, cities, city, citycapes, cityscape, downtown, exercise, highrise, Houston, houston skyline, houston skyline from the park, landscape, locals, modern, park, prints, skyline, skyscrapers, tourist, urban, views, walking on July 31, 2018 September 26, 2018 by Bee Creek Photo. The Texas Capital in Austin looking south with the sun going down behind the clouds which are back lit nicely from the underside making for an impressive sky over the capitol grounds. The Texas Capital is visited by thousand of tourist every year and it is one of the top tourist attractions in Austin and is an iconic historical site. The Capitalin Austin building was built in 1888 of granite in the italian renaissance style and it is a National historic landmark. The Texas Capital in Austin is located in downtown on Congress ave. This captial view is looking south toward the city with the two taller buildings the Frost Bank and the tallest building in the city the Austonian behind the captial. The capital grounds sit on 22 acreas and are very nice place to ejnoy the day. 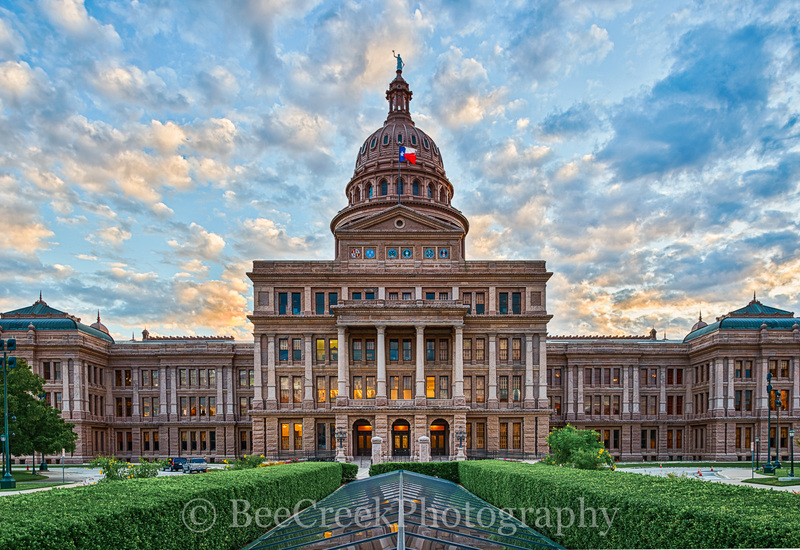 Texas Capital in Austin – This is another view of the Texas Capital in Austin as the sun going down behind the dome as the clouds are lit from the underside making from an impressive sky with nice color. Today the Texas Capital in Austin is one of the top places to visit in Austin it is located on congress aveune in downtown. The Texas capital in Austin is a National Historic Landmark since 1986 and it is visited by thousand of tourist every year and it is one of the top tourist attractions in the city. The Texas legislature offices along with the governor office is located here. You can view the legislature when in session or just enjoy the amazing architecture of the building or the park like grounds around the capital. The Texas Capital was built in 1888 of granite in the italian renaissance style and it is consider an historic landmark. The capital of Texas of is located in downtown Austin. The Texas legislature along with the governor office are located in the state captial. You can view the legislature when in session or just enjoy the amazing architecture or the 22 acreas around the building with it many statues. Also a four story extention was added 1993 which cost 75 million which gave much needed space for more offices, storage and a much needed a larger cafeteria. The most interesting part was that the four story extention was all done underground so it was barely noticeable from above. The orginal Texas Capital in Austin had not changed much after the extention was added from above ground, only some skylights and an rotundra are visible from above ground. Posted in Photo of the Day and tagged Austin, austin landscapes, austin places to see, austin texas, buildings, Capital, Capital of Texas, Capitol, city, downtown, fine art, historic, iconic, images for Austin, images for Texas Capital, images of austin, images of texas, images of texas capitol, landmark, photo, photo of texas, photos, photos of austin, photos of Texas capital, pictures of austin, pictures of texas, State Capital, stock photos of Austin, texas capital, Texas Capital in Austin, texas capitol, texas images, texas landscape, texas photos, texas pictures, texas politics, Texas State Capital, texas stuff on July 30, 2018 September 25, 2018 by Bee Creek Photo. Oasis Sunset Pano – One more image of this wonderful Oasis sunset on Lake Travis. Lake Travis is outside of Austin in the Hill Country which is a favorite place for locals and tourist to come and you can’t miss the Oasis restaurant for some good food and drinks as you watch the sunset set.The Oasis Sunset Pano – The Oasis sunset is the best place to capture a sun set which is located in the Texas Hill country outside Austin on Lake Travis. The restaurant is located in far west Austin at the foothills of the Texas Hill Country on Lake Travis. The Oasis restaurant likes to promote itself as the “Sunset Capital of Texas” with it decks facing west for maximum sunset views. The restaurant sit on a bluff about 450 feet over the lake overlooking the big bowl at the lake. Lake Travis is part of the Highland lakes, after Mansfield dam was built in 1942 it became the largest reservoir for water storage creating the largest area of water where the Oasis overlook is. The Oasis restaurant is popular with locals and tourist and it not uncommon to find buses lined up in the parking lot. It has become a destination for people traveling in this area of the Hill Country to visit to capture a peak at the sunset. Most people who live in Austin will tell you place go to see the view as the Oasis sunset is hard to beat in the area, the sunsets view from this location are great anytime of the year. The Oasis restaurant has been here for thirty years, but in 2005 a lightning fire destroyed parts of the structure but it was back in business about two weeks later, over time the portion that had burn down was re-built and expanded for maximun sunset views. This Lake is one of the largest reservoir of water along the Highland lakes. another beautiful sunset in the Texas hillcountry. Love that the sunset was almost here and they still have the umbrellas up they will take them down at sunset. Sunset at the Oasis Pano – One more landscape image of this wonderful sunset at the Oasis on Lake Travis. Lake Travis is outside of Austin, Texas in the Hill Country which is a favorite place for locals and tourist to come and you can’t miss the Oasis restaurant for some good food and drinks as you watch the sunset set. Love that the sunset was almost here and they still have the umbrellas up. Posted in Photo of the Day and tagged Austin, beecreekphoto.com, boating, destination, drink, fine art, fishing, food, hill country, lake, Lake travis, landscape, landscapes, Oasis sunset, recreation, restaurant, sailing, scenic, skiing, sunset, swimming, texas, texas landscape, Texas landscapes, Texas scenery, texas sunset, Tod Grubbs, tourist, travel, TX, views, water on July 27, 2018 November 9, 2018 by Bee Creek Photo. Golden Glow Over Bluebonnets – This was taken on the colorado river as the sunrise cast this golden glow over bluebonnets with these golden clouds cast their warm colors over this amazing field of wildflowers. Springtime in the Texas hill country is my favorite time because of all the wonderful wildflowers everywhere, especially when you come across a big field of bluebonnets like this it can be a magical landscape. These blueboonets were taken along the Colorado river in the Hill Country at sunrise as the sky and cloud had this golden glow. The Texas bluebonnets are a variety of blue wildflowers that grow in the State of Texas every spring which are of the genus Lupinus. Originally in 1901 the state declare only one blue bonnet the state flower however, in 1971 the Texas legislature declare that any flower found to be similar to Lupinus be declared the state flower. The name bluebonnet was from the look of the top of white part of the flower that was similar to the bonnet that woman wore on their heads in the pioneering days. The popularity of the blue bonnet grew after Lady Bird Johnson had push the Highway Beautification Act where she encorage everyone to plant native wildflowers along highways in the state. Today you can find wildflowers along many roads in Texas and the Texas Hill County has been known as one of the better places to find them. Bluebonnets love soil that drain wells and you will find them easily growing along the slopping areas along the roads. Of course some years are better than others but you don’t have to drive too far into the hill country to find them along the roads. It is almost that time for the bluebonnets to bloom anywhere between the middle of March to the middle of April depending on where and if we got the right amount of rain and sun here in central Texas. We also have other wildflowe that show up near the same time like Indian Paintbrush it changes year to year it is alway fun to see what will show up every spring. 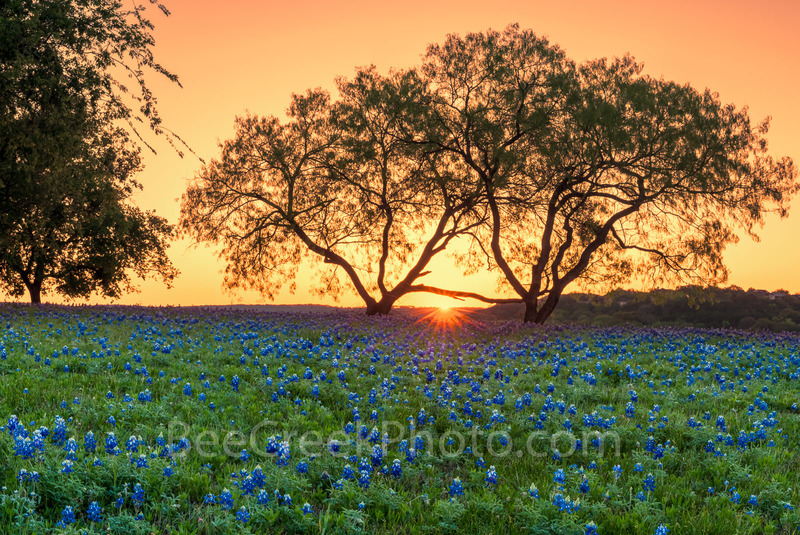 Golden Glow over Blue Bonnets – We capture this sunrise over a field of bluebonnets through the mesquite tree just as the sun came up and it created this nice golden glow. You can see the sunset is just coming up over the horizon through the two mesquite trees in this landscape. This was a nice field of wildflowers in the texas hill country. The Texas bluebonnet or lupine was declare a state flower in 1971 by the Texas legislature. Also Lady Bird Johnson help in her push to create the Highway beautification Act which is how wildflowers in Texas took root. We can thank Lady Bird for these beautiful spring wildflowers that are across our highways and park and where ever they may be. Posted in Best Of and tagged blue bonnets, bluebonnet, bluebonnets, clouds, Colorado River, colorful, colors, flora, glow, golden, images of texas, landscape, landscapes, oranges, pinks, plant, plants, reds, sky, spring, spring flowers, springtime flowers, sunset, sunsets, texas, Texas flowers, Texas wildflowers, water, wildflower, wildflowers on July 25, 2018 January 14, 2019 by Bee Creek Photo. Fort Worth Seventh Street Bridge – We capture this image of the Fort Worths Seventh Street bridge at night as the lights of the city came on in the background. 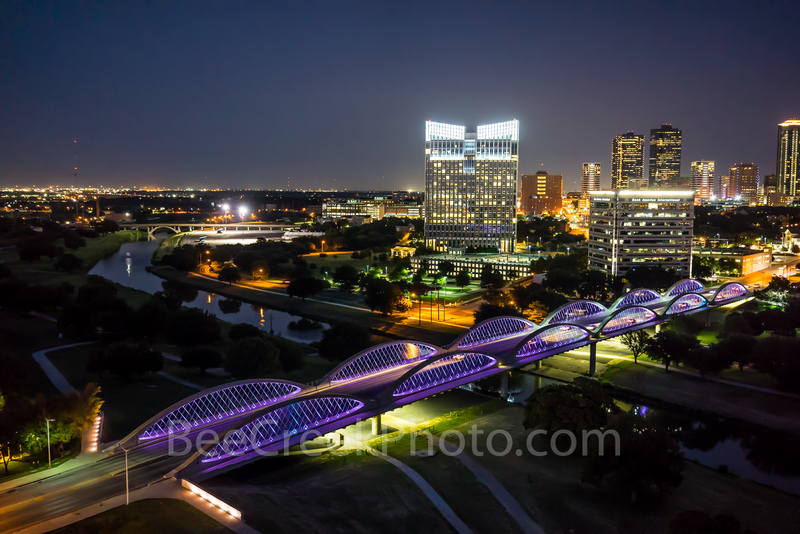 Fort Worth recently added this modern architecture bridge which connects the university area of the city with the downtown area to ease traffic accross the Trinity river. The Fort Worth seventh street bridge crosses over the Trinity river in downtown which flows through the city and to the Dallas area also. The close up view of the bridge framed the the cityscape at night very nicely with it modern architectural bridge and the city skyline in the background as the light came on in downtown Fort Worth. Fort Worth is the fifth largest city in Texas and it is growing quickly. In the past the city was known as a cow town because it was once part of the Chisholm trail cattle drives and had a rough tough brawling wild west kind of place. It still imbraces it western heritage but has grown to become a more modern city as it is now part of the DFW which includes both Dallas and Fort Worth. Fort Worth Cityscape – We capture this aerial cityscape image at twilight of the Fort Worth skyline with the Seventh Street bridge as it crosses the Trinity River in downtown. The 7th street bridge was lighted with purple led light so it really popped in this image of the cityscape. The seventh street bridge led light seem to change colors every day so that was a nice treat. You can see the Trinity river as it flows underneath the bridge which connects the city to downtown. Fort Worth is the fifth largest city in Texas. Ft Worth is located in central north part of Texas and the county seat is Tarrant County. The latest census is that the population for Fort Worth is estimates, at around 854,113. The city is the second-largest in the Dallas–Fort Worth–Arlington metropolitan area or the DFW Metro. Posted in Photo of the Day and tagged 7th street bridge, architecture, cattle drives, chisholm trail, cityscape, DFW, downtown, Fort Worth, Fort Worth Seventh Street Bridge, heritage, seventh street bridge, texas, Trinity river, university, urban, western on July 18, 2018 September 25, 2018 by Bee Creek Photo. Heavenly Texas Hill Country Blue Bonnets – Texas Wildflower Landscapes Canvas and Prints – Remembering this particular year of wildflowers I mean what could be better than the Texas hill country blue bonnets in spring and on this year with what seems to be endless field of flowers before you it hard to beat. Seeing this many bluebonnets in one place can bring out all kind of thing out in a photographer, its like your a kid in a candy store. Muleshoe Park which is an LCRA park along the Colorado river was overrun with bluebonnet wildflower on this particular spring. For us it meant several trips to try and capture these spectacular Texas Hill Country blue bonnetit before they were gone or at least before they were driven over and destroyed by all the cars,trucks and people who showed up for the wildflowers event. I think we arrived in the knick of time and capture this wonderful image just as the sun was setting over this field of bluebonnet wildflowers. Did not hurt that we were able to capture this wonderful sunset with it heavenly glow of orangse and pink colors in the sky with the Texas Hill Country and blue bonnets wildflowers for the perfect day. All you can see in this landscape is a field of endless bluebonnets wildflowers with the saltgrass growing along the bountries in Muleshoe Park. How this happen we are not sure but the area had been under drought condition this year and the water dropped leaving this area exposed again and I guess the seeds had washed into the lake and were sitting just waiting for some sunlight so some good can come out of a drought, who knew. This year was by far the best field of bluebonnets I have ever seen and unfortunately the second year this area at the park did not come back with bluebonnets, but the other side still of the park had enough flowers to satisfiy most. These bluebonnets only lasted till the drought lifted and then they were again covered by waters of the Colorado river and gone. They have never come back like this since only small patches along the waters edge. In my opnion this years crop of bluebonnet which was only around for two year was and is the Best Images of Texas Hill Country Bluebonnets we have ever had the opportunity to photograph. I might be a little bias. Heavenly Texas Hill Country Blue Bonnets – Texas Wildflower Landscapes Canvas and Prints – This particular year of bluebonnet wildflowers was the best ever in the Texas hill country with a sea of blue flowers everywhere. Seeing this many bluebonnets in one place can bring out all kind of thing out in a photographer, its like your a kid in a candy store. Muleshoe Park which is an LCRA park along the Colorado river was overrun with bluebonnet wildflower on this particular spring with bluebonnets pact so tightly into this area it was truly amazing. For us it meant several trips to try and capture these spectacular Texas Hill Country blue bonnets before they were gone or at least before they were driven over and destroyed by all the cars,trucks and people who showed up for the wildflowers event. 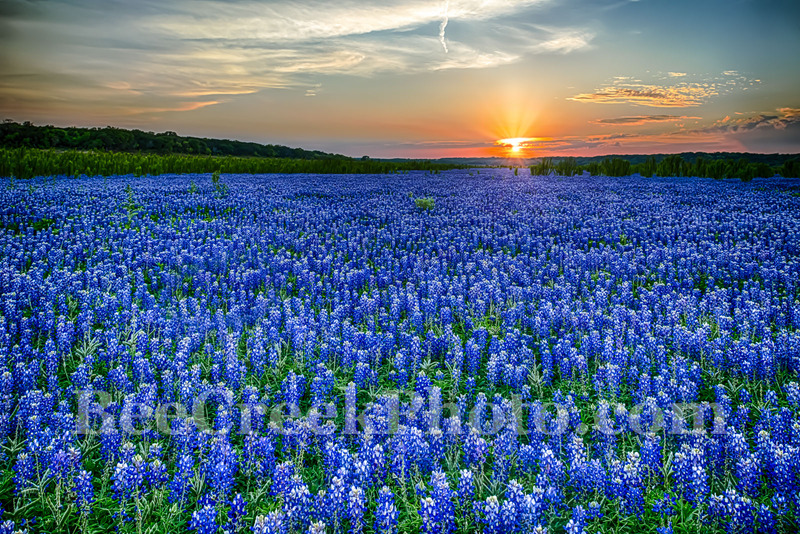 I think we arrived in the knick of time and capture this wonderful image just as the sun was setting over this field of bluebonnet wildflowers. All you can see in this landscape is a field of endless bluebonnets wildflowers with the saltgrass growing along the bountries in Muleshoe Park. How this happen we are not sure but the area had been under drought condition this year and the water dropped leaving this area exposed and we guess the seeds had washed into the lake are over time and were sitting just waiting for some sunlight so some good can come out of a drought, who knew. This year was by far the best field of any bluebonnets I have ever seen and unfortunately the second year this area at the park did not come back with bluebonnets, but the other side still of the park had enough flowers to satisfiy most. These bluebonnets only lasted till the drought lifted and then they were again covered by waters of the Colorado river and gone. They have never come back like this since only small patches along the waters edge. Posted in Photo of the Day and tagged bluebonnets, Colorado River, colors, field of bluebonnets, flowers, glow, heavenly, hill country, landscape, LCRA Park, muleshoe, Muleshoe Park, orange, pink, saltgrass, scenic, sky, spring, sun, sun set, sunset, texas, texas bluebonnets, Texas Hill Country, texas landscape, Texas wildflowers, wildflower, wildflowers on July 17, 2018 January 14, 2019 by Bee Creek Photo. 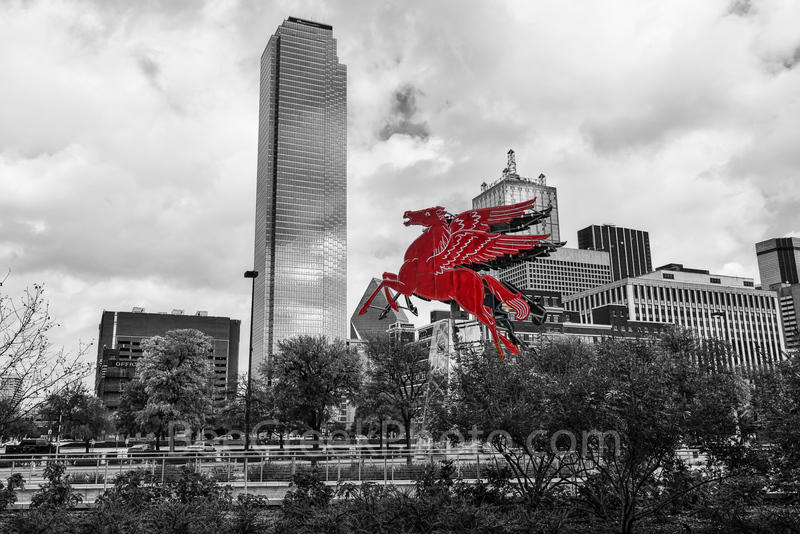 Dallas Downtown BW Red Pegasus – We capture this image with the Dallas downtown skyline in black and white with only the Pegasus in Red. The Pegasus has stood on top of the Magnolia Petroleum Building or Magnolia hotel since 1934 till 1999 when it came down due to damage over the years and and was replaced with a new flying horse which sits on top of the Magnoila Hotel today. However in 2011 a group of Dallas artist and entreprenuers reconditioned the orginal flying horse back to life and it was place on an oil derrick in front of the Omni Hotel in downtown Dallas. Dallas pegasus have been a sense of pride for the people living here especially in the early 1940’s through 1999 as it came to be a become that you were home once you saw it. When the Magnolia was built it was the tallest building in Dallas so you could see the Pegasus from quite a distance. Today it stand in from of the Omni Hotel with the down Dallas skyline including the bank of America plaza, Renaissance Tower, Fountain Place to name a few of the most iconic buildings in the city in this scene. The Pegasus and Dallas go back a long time it has become a landmark for the many who live and visit the city. Dallas Downtown BW Red Pegasus – We capture this image with the Dallas downtown skyline in black and white with only the Pegasus in Red. The Pegasus has stood on top of the Magnolia Petroleum Building or Magnolia hotel since 1934 till 1999 when it came down due to damage over the years and and was replaced with a new flying horse which sits on top of the Magnoila Hotel today. However in 2011 a group of Dallas artist and entreprenuers reconditioned the orginal flying horse back to life and it was place on an oil derrick in front of the Omni Hotel in downtown Dallas. Dallas pegasus have been a sense of pride for the people living here especially in the early 1940’s through 1999 as it came to be a become that you were home once you saw it. When the Magnolia was built it was the tallest building in Dallas so you could see the Pegasus from quite a distance. Today it stand in from of the Omni Hotel with the down Dallas skyline including the bank of America plaza, Renaissance Tower, Fountain Place to name a few of the most iconic buildings in the city in this scene. Posted in Photo of the Day and tagged Bank of America plaza, black and white, buildings, bw, dallas downtown, Dallas Downtown BW, Dallas skyline stock photos, downtown, flying horse, Fountain Place, greek mythology, iconic, Magnolia Hotel, Magnolia Petroleum Building, oil derrick, Pegasus, red pegasos, red pegasus, Renaissance Tower, skyline, tallest building on July 11, 2018 September 25, 2018 by Bee Creek Photo. This year was a particulary good year for sunflowers fields so we made the trek to capture a sunflowers at sunset landscape. So we made the trek about a four hours drive to try and capture the flowers several times in the month of June finally after our fourth try we were able to capture a good sunflowers at sunset landscape image. We made many attempt to get this photo going back several times to try and get this field of sunflowers at sunset and on our last try it finally worked. We had to added a little flash to keep enough light on the sunflowers at sunset as it was starting to get dark. We were not alone trying to capture this photo along IH35 that day there were many cars stopping to take picture of sunflowers fields and every time we came after. It was a pretty awesome site, farmers are now using giant sunflowers in their rotation of their crops so they can go on for miles in some area. There scientific name is Helianthus giganteus, is a large annual flower grown as a crop for its edible oil and seeds. Smithsonian Magazine made this photo of the day. Sunflower Sunset Landscape – We made many attempt to get this photo going back there five times to try and get this field of sunflowers at sunset and on our last try it finally worked. We had to added a little flash to keep enough light on the sun flowers as it was getting dark. We were not alone trying to capture this photo along IH35 that day there were many cars stopping to take pictures of these endless sunflowers landscape fields and every time we came after. Farmers now are using sunflowers in their rotation of their crops so they can go on for miles in some area. Posted in Photo of the Day and tagged crop, farm, flora, giant sunflower, Giant Sunflowers, image of flowers, images of sunflowers, images of texas, landscape, landscapes, photo, photos from texas, photos of sunflowers, photos of Texas, picture of a sunflower, picture of sunflowers, pictures of flowers, pictures of sunflowers, plants, spring, sun flowers, sunflower images, sunflower picture, sunflower sunsets, sunflowers at sunset, sunflowers at sunset landscape, sunflowers pictures, sunset, Texas flowers, wildflower, wildflowers on July 7, 2018 January 14, 2019 by Bee Creek Photo. Fireworks Over Lake Austin – Its that time again, Austin Fireworks over Lake Austin. Its that time again, Austin Fireworks over Lake Austin from the 360 bridge. 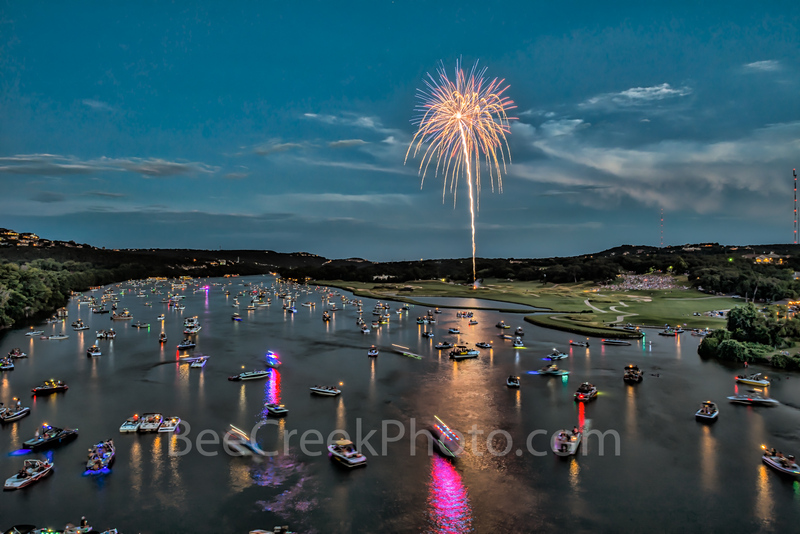 Here is a image from the fireworks we took at Lake Austin firework show. What I like is all the boats in the water watching the show from their boats. It is a great way to see some fireworks. No matter what your doing for the big holiday grilling out with family and friends it always good to topped off the evening with some local fireworks and what better way than by boat if you can. Don’t worry if you don’t have a boat you can watch from land too or go to the many other places including downtown Austin for some fireworks and symphony along with many small towns in Central Texas area for their fireworks. This images capture the show of Austin Fireworks on Lake Austin from the Austin 360 bridge or Pennyback bridge. This fireworks show over Lake Austin is put on by the country clubs and not every year do they have one or sometimes they do it on other times, so it pot luck as to if they have one this year or not. It is not posted anywhere so you just have to hope it on for this year. We took these photos of the fireworks at the fourth of July Fireworks on Lake Austin off of austin 360 bridge over Lake Austin. All the boats came out to watch the show along with many on the cliffs nearby and on the Pennybacker bridge to see the firework show. There were more boats in the water as their were people watching from land. Posted in Photo of the Day and tagged 360 bridge, Austin, austin texas, Austin Tx, boats, country club, fine art fireworks, Fireworks, Fireworks on Lake Austin, fireworks show, fourth of July Fireworks, Fouth of July, lake austin, Pennybacker bridge, pictures of austin, pictures of texas, summer, water on July 2, 2018 November 9, 2018 by Bee Creek Photo.